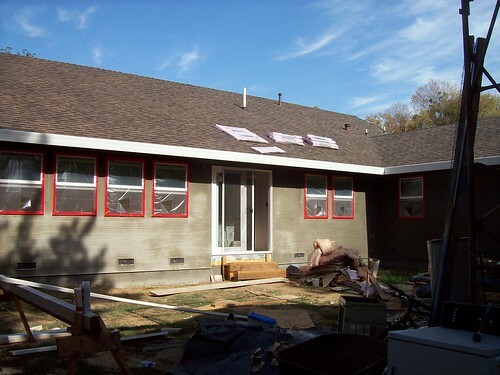 It’s sure handy being one of the few people building or remodeling a home at this point. I called Jack, our stucco subcontractor, yesterday afternoon to see if they could put the first coat on the house now, seeing as we didn’t have the shop ready yet. Jack: “No problem. Is the drywall done?” Well, they’re still taping and texturing, but the drywall is up and they’re done hammering if that’s what you’re asking. “Okay, I’ll have a crew out tomorrow morning!” Uh, Jack? We have a whole bunch of stuff right next to the house. Maybe you can give us a few days to move everything? Jack: “Don’t worry about that, the crew will move it for you.” Wow! About 8-10 people showed up this morning at 07:00, and the scratch coat was done before I came home for lunch at 12:45, less than 24 hours after I called. Barb has Friday off, so we’ll probably call for our stucco scratch inspection that day. 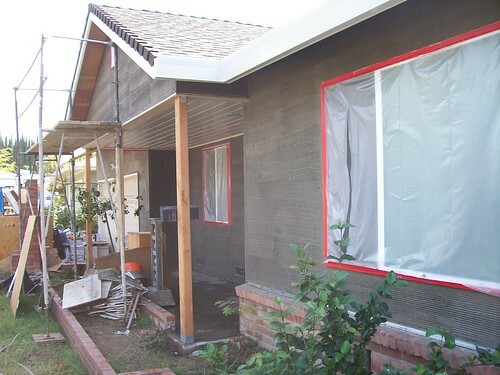 This entry was posted in Our home remodeling project, Uncategorized and tagged stucco. Bookmark the permalink.